If so, the Cheez Land Uke Band is for you. We're glad you found us. We are a group of people with a passion for playing and learning to play the ukulele. We meet each week to play, sing and help each other improve and we are led by our Musical Director, Beth Miller. Some of the more experienced players even perform for others. Take a look at the "Performances" page to see a few of the club's performances. Did you know...that the sale of ukuleles is growing faster than any other musical instrument in the industry? It's true. In fact, it's been true for the last ten years. Why? It's fun. It's easy to learn. It's easy to play. It's small. It's portable. It's inexpensive. It's social. It makes people smile. It's used to play ALL kinds of music. Are you ready to get started? Let's go! We meet at the Moose Lodge , 1932 Ward Ave in La Crosse. It is near the Marcus LaCrosse Cinema. Every Wednesday from 6:30 to 8:30 PM. Beginners should come at 6 pm. Come early if you want to grab dinner served by the Lodge! Yes, but it's minimal. We ask all players to donate $3 at each meeting to help cover the uke club's ongoing expenses for music equipment and instrument acquisitions, music and form copying, URL registration, bookkeeping and accounting costs to maintain the club's non-profit status, website maintenance and various other costs. Do I Need a Uke to Begin? No. Not to attend your first meeting. There are a limited number of "loaner" ukuleles available for you to use if you do not own one. If you enjoy your experience and want to attend more, you'll want to buy a ukulele. For a $10 deposit a loaner uke may be taken home during the week to practice. Send an email message to cheezland.info@gmail.com if you plan to attend a meeting but do not have a uke. We'll make sure there is an extra uke at the meeting for you to use. Ukuleles come in 4 sizes. From smallest to largest the sizes are called soprano, concert, tenor and Baritone. 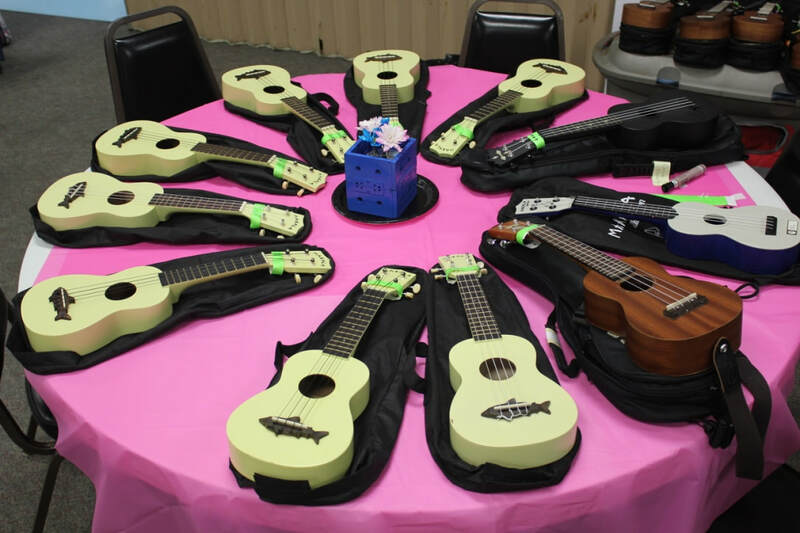 Before you buy a ukulele, try out a couple of different sizes at our meetings. We'll help you decide which size fits you best. This is especially important if you've never played or purchased a musical instrument in the past. Questions? We'd Be Happy to Help!